Whether you are preparing for a school play, Halloween, or just a fun Saturday at home, creating a monster mask with your child will keep them busy, let you spend quality time together, and serve as a creative outlet. By taking a brown paper grocery bag, you can easily create a paper mask. This type of mask can be wrapped around your child’s face and fastened in the back by masking tape or thread. Measure around your child’s head, and make sure to add a couple of inches so that the mask can comfortably be adjusted. 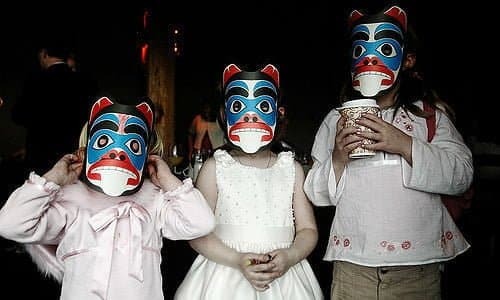 After you’ve cut holes for the eyes, your child can use markers, feathers, paint, or whatever they choose to decorate their mask. If you have a plastic face mask, this will create a great base to create a shaggy monster mask. You can cut 2 inch pieces of yarn and glue one side of the yarn in bunches to imitate a shaggy hair appearance. Using construction paper to create a mouth with sharp teeth would add to the scary effect. Masquerade masks are really convenient to use since many already come with elastic string for easy wearing. You can create scary designs on the plastic part of the mask, and then add fabric that drapes down over the rest of the face. Since masks can be made out of paper, cardboard, plastic, clay, and other materials, you and your child can get creative when making your monster mask. What did you and your child choose to do for your monster mask?